Wherever you look in New Brunswick, there are plenty of plantation shutters choices. And when you’re researching which non-wood shutter is best for you, it’s not easy to distinguish the differences. You can easily make the wrong choice and end up ordering shutters that aren’t durable. Are solid polymer shutters, like our best-selling Polywood® shutters, worth more than composite shutters? Here are three ways Polywood shutters are a better choice than composite shutters in New Brunswick, NJ so you can choose. Polywood shutters are constructed from a first class solid polymer that ensures the most color-retention, durability, and rigidity than any other shutter you can find. With that, the shutter louvers won’t warp over time. On the other hand, composite shutters are fabricated from a pressed-board core, wrapped with poly-vinyl. The vinyl wrapping the pressed board is prone to peeling from the core substance easily. And this peeling happens even faster in humid, wet, and hot climates. Another option for non-wood shutters is hollow vinyl. But they disintegrate the fastest in large part due to the material. Both forms of non-wood shutters are vulnerable to warping and deterioration when exposed to the different weather conditions in New Brunswick. Polywood is made with UV inhibitors that do not absorb heat. And because heat is the biggest offender in cracking the shutter louvers, Polywood is hands down the most durable plantation shutter you can find. Polywood shutters colors include three superior white paints. We bake the paint finishes on each component at hotter temperatures than New Brunswick has seen. Our patented finishing process uses UV inhibitors to make sure the color never fades. Other types of non-wood shutters are available in either low quality paint finish or no paint finish at all. In the majority of cases, the vinyl wrap is the all the color you get. Yes, this finish appears to be adequate at first. But it fades with time. And as to hollow vinyls, some are painted. With the vinyl being a heat conductor, this adversely impacts the finish day after day. Third party tests illustrate that Polywood shutters block up to 30° of temperature and lead to reduction of heat transfer by up to 45%. With that, Polywood insulates up to 70% better than the top solid wood shutter. It’s the heat blocking properties of the solid polymer material Polywood’s made of that make these plantation shutters so energy efficient. Yet what makes Polywood even more energy efficient than composite shutters is the weatherstripping on the louvers and panels. 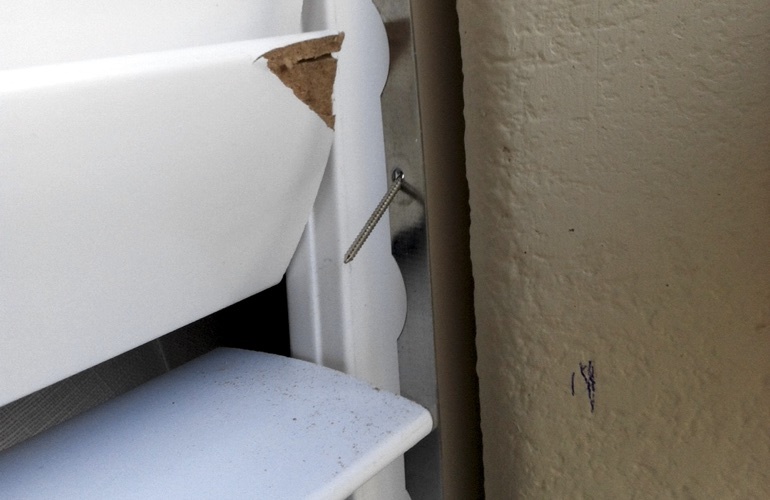 All you have to do is interlock the weatherstripping pieces while closing the panels and you get the tightest seal possible against the effects of the weather outside. You won’t find all the energy savings that Polywood offers in any composite shutter. Back in 2004, Sunburst Shutters Las Vegas had Polywood shutters attached to the sides of their trucks as part of the graphics. They were parked outside and saw the natural elements Las Vegas is famous for. That’s intense heat for five months out of the year! The Polywood shutters had been fastened to our company trucks for more than 7 years. That’s when our team conducted an experiment to see how effective Polywood is in retaining the original paint color. We wiped the Polywood shutter that was on the truck clean. And we held up a new Polywood shutter next it for comparison. The color was the same. There wasn’t any visible signs of fading or discoloration. It further validated for the team that our paint finish is indeed the best around! And with Polywood withstanding so much heat damage on the road for over 7 years, it’s undoubtedly the most durable shutter for your residence in New Brunswick, NJ. Interested in learning more about Polywood shutters? Call 732-301-6168 for an in-home design consultation. Our professionals bring you samples of all the frame styles, color options, and louver sizes available. We take measurements of your windows to give you the most precise shutter estimate. And once we’ve installed your shutters, they’ll fit your window beautifully. We’ll also discuss with you the specifics of the lifetime warranty available on these shutters. Call 732-301-6168 or fill out the form below to schedule your free in-home design consultation today!